Rustans Fresh opened in our city a couple of months ago and we are eternally grateful that it did. For the first time, we found new ingredients not readily available in regular grocery stores. It was in Rustans that Jan discovered an amazingly wonderful thing, tomato pesto! Sometimes I find plain pesto a little strong, but the one mixed with tomato is milder and a lot tastier. The bottled paste that we bought is light orange in color and can be found in the imported section. Here's Jan's perfect pasta dish with tomato pesto. 2. Heat oil in a pan and sauté garlic until slightly brown. 3. Add onions until transparent. 4. Add mushrooms. Cook for 1 min. 5. Pour cream and let it cook for 4 mins. Mix thoroughly. 6. Add tomato-pesto and mix. Cook for another 4 mins. 8. Remove from heat and pour over pasta. Wife's Verdict: Surprisingly tasty! I did not expect this because I always found green pesto strong and veering towards "herbal" in taste. I suppose the addition of tomato into the pesto paste changes everything. This is by far my favorite of Jan's pasta dishes. 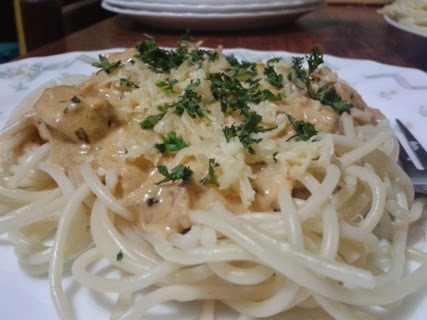 Jan's Quip: "My best pasta recipe. At least until the next one comes along."